The sequel to Platform Battle has its own thread! Visit the Platform Battle 2 development thread and try out a demo! Platform Battle is a hotseat platformer game in which two players battle each other with different characters. We really would appreciate your input! Recently we broke the one thousand play mark on YoYo Games. Thank you for your support, GMC! Please look beyond the lack of AI. My friends and I (used to) come back again and again to play it. Another friend of mine played it with his little brother for an hour when he first played it. What feedback we have gotten has usually been positive. It has been suggested time and time again that this game have AI in it. While I agree that that would make the game more fun, first of all, our programming probably isn't good enough for us to figure that kind of thing out, and second, I don't want this game to be enjoyed alone. Why? Because it's unhealthy. However, see below. We started the development of a sequel sometime around October or November of 2008 (at the time of this edit it was December 8, 2008). This announcement is more for record keeping than for anything else; however, suggestions are welcome! Those suggestions should be about things other than characters and levels (we will probably be developing our own characters and levels). Thank you to samdamana for suggesting that we change the controls for Player 2's attack! 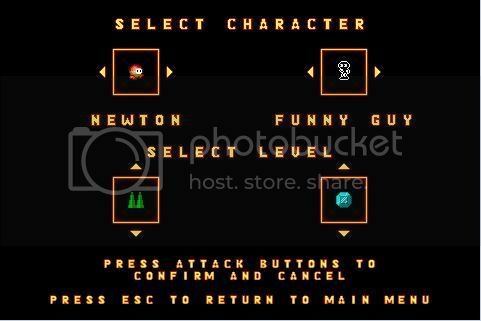 In the sequel Player 2's attack will be, as he has suggested, executed with the ctrl key. Edited by lasttea999, 31 October 2011 - 03:33 AM. We would really appreciate a review or two. Try it with a friend - we're sure you'll like it. This game has been a pretty good hit among my friends; it just needs some more online visibility, and reviews on YoYo Games are the perfect thing! I'm not sure why that is... An earlier version (which is pretty much the same as the completed version) can be downloaded here, however. I must say it looks like a very nice game, graphics, fx and musics fits the style. On YYG go into <MY ACCOUNT> then <EDIT GAME> at the bottom of page, then <REVIEW GAME> i think, then set the game to <Standard>! Thank you very, very much for your feedback! I have to apologize - I'm not used to forums, and I realized just now that I committed something called "illegal bumping" earlier. I'm very sorry! Also, thank you to the member who told me how to make a game download-able. Edited by lasttea999, 08 September 2008 - 08:39 PM. A member asked why both members choose a level when only one is selected to be played in. You know how in any multiplayer game, you sometimes have to discuss with others what level you want? Well, with Platform Battle, each player submits a level they want, and after that, the game randomly picks one out of the two selection. This way, there's no hard feelings (hopefully). Well this simple little game had me and my brother entertained for about forty minutes. It was pretty fun, but I don't think we'll be playing it anymore. The gameplay was alright, just a tad too simple with only one attack and one special attack. Some of the special moves were quite original, like the one that could move on the ceiling (which was the best character by the way). Why is that whenever the egg-bird thing transforms into the bird its hp is set to 4, no matter if it was higher or lower before? Strange.. The game was rather unbalanced though. The guy with the gun was really crappy, I think his name was "Tommy." Also the slow moving robot thing didn't stand a chance against most of the other characters, although its homing missiles owned on the lava map. Fourty minutes is shorter than some of the big GM games, but it's still pretty good. The whole point of our game is that they're fourty minutes spent with another person. That you won't ever be playing it anymore makes me very sad indeed! Perhaps you and your brother are a bit older than the game's ideal player? I feel that the game's simplicity is another one of its strong points. I have to admit, it's simpler than other video games, but this simplicity (especially the simplicity of the characters' hp), while the game requires more skill than, say, rock-paper-scissors, allows players to calculate the ensuing moves with what I can only describe as "strategic precision". I think players will know what I mean after a few rounds. On the two mentioned "bad" characters (the guy with the gun and the robot): We've actually been getting similar feedback left and right. My friends and I can manage to compete well with them, but I suppose they are kind of hard to use. This is a finished game, however; I wonder what we can do. By the way, the bird is a lot cooler if he sets himself to 4 HP. If he lost a certain number of HP, he'd either be too good or too bad depending on its HP at the time of its transformation. Great game! I like the way all the graphics fit together so well. The characrters are good and their attacks are also quite good. 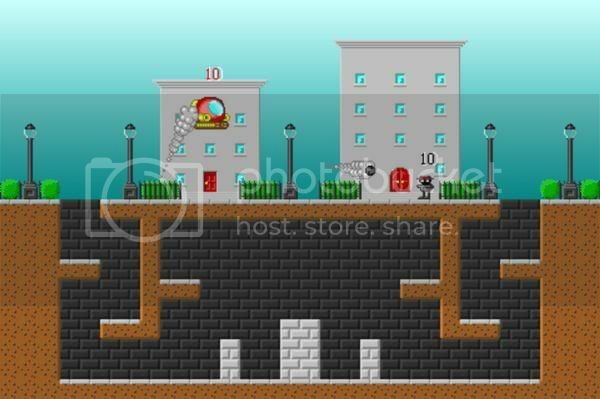 A couple things i would like to see changed to make it better would be three or four ai levels so that you can have one player, and a level editor for the people like me who like to make their own levels. I was playing it for about an hour before i had tested all the levels so the game is fun. Oh and the only guys that seem quite unbalanced are the big robot and 'tommy' the gun guy. perfect example of this is that tommy can only fire three shots then has to stop yet the first guy (forgot his name) can throw bombs continuously. I love the bird ^^ Maybe a color or costume select would be in order? I like the way most of the secondary characters looked over how the player ones looked. Maybe a simple three color set up would be good? And my final suggestion would be change the attack button for player 1 from being '1' its kinda out of the way so a button like 'q' would be better. I play video games OFTEN. I own many. But, that doesn't necessarily mean I approve of them. With this game the focus was not to make a game into which one person can become absorbed alone; rather, it was to make a game that two or more players can enjoy (along with each other's company) when they have nothing better to do, kind of like a board game. I'm pretty sure that AI would make this game a lot more fun and, to the GMC, "better", but I don't think it's fit for this game. That being said, my friends and I are hoping that we can add online play to a second game! We are pretty excited for that; I think we can figure the programming out. A level editor would also be awesome, but, again, we're not very good programmers! I like the color motif we've got going; it's kind of like checkers. But it'd be cool to make your characters your favorite color or give them hats, or something. Edited by lasttea999, 15 September 2008 - 06:03 AM. I know my record shows me to be a complete newbie, but this game really is made quite well. I need help giving it more visiblity; I think people would like it, if only they could be shown it. Can anyone please advise me in getting more YoYoGames reviews, and more replies on this forum topic? I thank you in advance; I've heard people are discouraged to read a topic if the last person to post a reply is the topic starter. Edited by lasttea999, 20 September 2008 - 07:03 PM. Can anyone please advise me in getting more YoYoGames reviews, and more replies on this forum topic? From what I've heard, and partly seen, is that this forum is not the best for getting any good replies, let alone constructive criticism or any type of review. This is the only forum I visit regularly though, so I don't know of any else that might be better. I've heard people are discouraged to read a topic if the last person to post a reply is the topic starter. Well personally I don't care who made the latest reply. However now you've got this reply here so maybe you should wait a little before answering it. I'd also advice you to put up screenshots of the game here in the topic. The graphics are a bit simplistic, but they fit togheter and look rather nice I think. The name "Platform Battle," while basically saying all there is to the game, is not a very original name, and might put off someone just having a quick look at the first page games. Edited by Ecstats, 21 September 2008 - 12:44 AM. but I liked the idea, gameplay was not special, except for that tommy guy and the anti-gravity guy.. very cool. Thank you very much for your feedback, ladies and gentlemen! I suppose it is kind of dull, but I've kind of grown attached to it! ...Sorry, I'm a newbie; what's a hotseat game? I got the impression that we should all support each other, though! Thanks! Edited by lasttea999, 26 September 2008 - 03:02 AM. hotseat means multiplayer on one computer. Uh... What's a "mirror"? Also, which one do you recommend? My topic really isn't getting much attention. What am I doing wrong? I now have a link to this game in my sig, but it's still not getting much attention. Iv'e had positive reviews; what am I doing wrong? I've been told I need to be involved more, however. Edited by lasttea999, 12 October 2008 - 02:06 AM. It's a great game, but you shouldn't be using Game Maker 5.3... If you don't like Game Maker 7 for whatever reasons many other people do, you should at least try and use Game Maker 6. It should be able to open the game's file, I think. You should add some more gameplay modes to it, so people can have more fun with it. This was surprisingly addicting. Me and my friend played it for an hour and a half. I loved playing as Newton, except most of the levels had no roof and my friend was being a shmuck and always picked that volcano stage. The only suggestions I would have is maybe add one or two more attacks (combos too?) and maybe even some flexible options such as how many lives you can have in a match, time limits, possibly, etc. Other than that, I really enjoyed playing it, nice job! Edited by GammaFoxTBG, 16 October 2008 - 01:34 AM. Actually, I was only using GM5 because I'd never used any other version before. I'll be using GM7 (Registered) for other games. It's so annoying when people abuse Newton's abilities! Edited by lasttea999, 30 October 2008 - 07:54 PM. It'd be cool to be able to reverse Newtons gravity while in air, like if you made a mistake. Oui, but the next possible speed might be a bit too fast. The speed probably wouldn't fit the characters' sprites. Thank you! My friends want me to update the graphics in a sequel, though. Still, pretty cool. If it was to be released on a platform like gameboy colour, i'd give it 8.5/10 - could use more attacks. If it was to be released on anything more recent, obviously, it wouldn't be up to scratch. Good job considering GM5 though. I am in the GM Reflex Test! I got 0.13! I was actually aiming for graphics a bit better than GBC, but then again, I haven't had much spriting experience. how do you download it from yoyogames? There should be a download link on the right side of the page. You'll probably have to scroll down a little. We have commenced the development of a sequel. Any suggestions? Also, we'd really appreciate help with integrating online play into the sequel. 1. Make the attack for Player 1 (I think changed to Ctrl from Shift. I constantly get the sticky key Pop-up! 2.Create a single player mode with an AI similar to the one in "Cell Burst" (http://www.yoyogames...ames/show/23927) Very Nice! You could probably message him or something for a source of the AI. 3. And finally Some of the effects. The Animations are very nice but the graphics themselves are pretty bad. For instance the big ball with tank wheels that can fly for a few seconds has a nice starting animation (like the grass) but once ended its a just a still picture. It Needs to be a continuous nice smooth animation. 4. Lastly sound effects seem to drown out the music. Like the punch and the rocket booster need to have there volume greatly reduced. For the most part Nice Job! I dunno about this one. My friends and I have gotten so used to that control arrangement. Plus, Stickey Keys can be turned off. Funny thing is, the friends helping me with this game have been bugging me about the graphics. We're working to improve them for the sequel, but, specifically, I think it'd be hard to have an "idle" animation for sprites that are less than 32X32, simply because they're so small and don't have many pixels to accommodate something like that. Wouldn't the characters look like they're having convulsions, or something? We couldn't deal with this either because we were using MP3s or because we didn't have the registered version of GM5 (I can't remember which problem mattered), but I think we'll be able to fix this for the sequel because (if I remember correctly) GM7 doesn't accommodate MP3s (and so we'll be forced to use another format), and because we now have registered GM7. Edited by lasttea999, 07 December 2008 - 07:18 AM. Is so people will play with their friends. Can't you...ya know...make it so you have the option of playing with the AI, so people who don't have someone to play with can enjoy this game also? But that would be pointless once you get the online play going. So balance the characters, add online, and you have a golden GM game right here. "So people will play with their friends" isn't the only reason. The other reason is, while we've gotten better at programming, our skills aren't nearly advanced enough to make AI. And I think we want to keep the team small. Also, I think the number of people who don't have a friend to play with are much fewer in number than the people who need to make video games a smaller part of their lives (to be fair, I'm probably one of them). But really, like Dizzi D seems to be, we're really in favor of online play. I'm sure that it's going to be a great help to those people who truly don't have a video game player living near them. Maybe online PB will help make new friendships! Edited by lasttea999, 28 December 2008 - 04:09 AM. "So people will play with their friends" isn't the only reason. The other reason is, while we've gotten better at programming, our skills aren't nearly advanced enough to make AI. And I think we want to keep the team small. Also, I think the number of people who don't have a friend to play with are much fewer in number than the people who have friends, and need to make video games a smaller part of their lives (to be fair, I'm probably one of them). But really, as Dizzi D says, we're hoping we can get online to work. I'm sure that's going to be a great help to those people who truly don't have a handy video game player around. Maybe online PB will help make new friendships! You only need to be advanced to make 'good' AI. And by good, I mean it will sometimes purposely make mistakes and such. Otherwise it's not that hard. I couldn't make a game of this caliber but I can still make a simple, 'make no mistakes' AI, I've done it with one of my older games. Like such, if it's a platform, and the player is higher then the computor, make it so it will check if it's at the edge of the platform while it's moving towards the player, and if there's a gap, vspeed=-whatever. That should make it look like it's moving towards you, but I dunno how to make it find the shortest path when you're above it. Then for attacking, just make it check if you x is 16 more then it's x, then change sprite for a few seconds, then do the stuff you do for players attacking eachother. That's a simple rundown of how you could go about it though. Edited by Dizzi D, 28 December 2008 - 04:13 AM. That's a good foundation for AI. There are bigger problems, though, like calculating the height of jumps (and falls), moving around walls, accommodating for the abilities of different characters, and making varying AI difficulties. Kind words for an unworthy programmer, sir! As lasttea999 has said, we are developing Platform Battle 2, and it looks pretty promising. For those of you who have complained that the graphics are too simple, we are adding much more flavor to the look of the game. Perhaps we can upload some screenshots sometime in the future. For those who commented that the graphics are nice and work well, don't worry; the levels and sprites themselves are looking much more detailed, but the style of art still remains. Dizzy D, while your AI foundation suggestion covers the basics of a fight, there is much more to battling on this game than you may think at first; being one of the spriters/testers/other whatevers, I've played it quite often, and I have found that certain combinations of levels and characters make perfect opportunities for a certain maneuver. For instance, there's something I call 'rebounding' that Pierre can do only against Pancho (not because it's a special move programmed into the game, but because of the way they both work) in which Pierre blasts into the sky right next to Pancho, dealing 1 damage, then lands behind him and blasts off immediately after landing, dealing 1 more damage and leaving Pancho in the dust before he can hit Pierre. I've dealt about 6 damage with this strategy in consecutive hits, but it is very hard to do; it requires perfect timing, something that computers are flawless at. It would be very difficult to program imperfect timing in such a thing as this to replicate human playing. Is this understandable? Plus, as said before, online play will outdo the desire for AI, but we will need plenty of help with this. As said before, any feedback is welcome! Enjoy the game! And don't hesitate to post if you have feedback. Edited by BENJAMUS, 02 January 2009 - 06:13 AM. Wow. I LOVE this game. Me and my Cousin had a LOT of fun with it. It's fantastic. The characters are vibrant, creative, and varied, and the levels have enough to them to not get old. This is really gold. It's beautifully unpretentious, and the visuals are great. I can't WAIT to hear more about the sequel! I hope you'll include all of the characters from this game on top of any new ones you make. My goodness, what a positive comment. We're glad you enjoyed it. Now, keep in mind, in PB1 (Platform Battle 1.00) there was a very bad character, Tommy. As much as we like him, we can't figure out a fitting, pleasant, and effective way of making him better. Thus, we are considering cutting him out of PB2. But! If we cut Tommy, that frees up room for a new character we're sure you'll enjoy. Unfortunately, I can't tell you any more. In fact, saying this may have been too much. We're trying to keep as much as we can secret for the final release. Sorry. This looks pretty cool, ill edit with my reply later, im dl ing now. I don't think I would spend over an hour playing it, but its definitely fun, and is enjoyable in bursts. So play it for 10 mins maybe. But then a little while later I could play it again. Youve put alot of work into this, and it finishes as a very nice game, suitable graphics, music left a little something to be desired. Edited by Revenge, 05 January 2009 - 03:20 AM. your playing 2p games right? since you're game is made only for 2 players. check out madness reloaded 2008 in my Sig, it's my latest 2p game and you'll like it. I had alot of fun playing it against my mates. only problem is that the game ain't support online gaming, so maby we can help each other out here. I guess I may as well come out from the bushes now. I am the third person working on this project. Teacup (lasttea) was the main programmer, and character designer, since the game was his idea. My job was level design and tileset design, as well as character balancing. Benjamus was music and some tilesets. Addictive, flavorful, and stylish. The game is simple and easy to learn, while not being too simple. The characters were unique, the levels were varied, and gameplay is generally balanced. The necessity of having both people at the same computer can be rather inconvenient, and some of the buttons were frustrating. The music was either hit or miss. People either loved it or hated it. Personally I thought it was great, but then again I helped create the game, so my opinion is a little biased. The tilesets were very simple, which was part of the stylistic plan, and people either loved it or hated it. So the feedback was generally positive, and based on the negatives we have decided on some new features for the sequel. -Online play, as you may have picked up on, is in the works. I should warn you, though, that this is going to be hard for us. -More characters and levels and play types are on the way. We are going to stick with no AI, unfortunately. The main reason being that it is too hard, but also that it would be in poor taste for this game. Not only would the AI need to determine how to move, it would need to determine how to attack. It needs to know where the attack will hit, how to judge if the attack will hit the player or not. For example Newton's Grav-bomb. It travels in an arc and has an AOE blast. Will the computer aim so it his you dead on? Will it try to hit you with the explosion? How will the computer trace the arc so it hits? Will it abuse the Anti-grav effect to dodge and confuse? How would a computer determine what confuses? See, an AI for this game would be insufficient, and not provide you with enough entertainment. And nothing compares to playing with a friend. I would love to submit ideas if you need anything for Character's Secondary attacks, character ideas, or what not, but I imagine you have that handled. Perhaps you could add a third attack? But that would cause a huge increase in game testing required. If you do any Beta testing, I would love to participate! And you ARE keeping Hotseat game play, right? Are you considering adding support for more than 2 players? Perhaps support for a generic gamepad if possible? What if Tommy's secondary ability was a transformation ability like Iggy, but he instead jumped in an old 1920's car, and could ram other characters, or shoot upward, but not be able to jump? Perhaps make it able to be toggled under certain circumstances? Or make him unable to shoot while in the car, but to enable him to still hit air targets, make his main attack fire many more bullets per spray, but in a spread. The invincibility gap between hits should prevent instant death or anything, but it would take adjustment. I think he could be revamped somehow. Anyway, can't wait to see the new levels! Will they be larger than one screen, so you could scroll or something? I would love to submit ideas if you need anything for Character's Secondary attacks, character ideas, or what not, but I imagine you have that handled. Yes, we're going to do that all ourselves. We almost have all of them figured out. Perhaps you could add a third attack? But that would cause a huge increase in game testing required. We're not going to add third attacks for various reasons. If you do any Beta testing, I would love to participate! Thank you for all oyour enthusiasm and willingness to help, but we aren't planning on releasing any beta versions. As I said earlier, we are keeping as much as we can secret from anyone until the final release. And you ARE keeping Hotseat game play, right? Of course! That is what the game is about! The online play is just for additional taste. Are you considering adding support for more than 2 players? Probably not. More than two players would be impossible for a (comfortable) hotseat game, and online paly would require different level layout per amount of players. Perhaps support for a generic gamepad if possible? I don't know about this. Again, probably not. What if Tommy's secondary ability was a transformation ability like Iggy, but he instead jumped in an old 1920's car, and could ram other characters, or shoot upward, but not be able to jump? This wouldn't work. I can't tell you what we're doing, but I can assure you that the character taking his place will indeed make up for it. Again, I can't tell you specifics, but I can tell you that the game will keep the same graphics style but will contain more detail. I'm going to go ahead and say that the rooms will be the same size to keep the same look as the origional, possibly with a few exceptions. Thanks again for your support! Well, that all sounds good to me! Can't wait for more news, or a thread dedicated to PB2. It does sound really cool, I suggest that maybe you could make levels just a little bigger, then add splitscreen maybe? But I hope it comes out soonish! NEWTON TO THE MAX! Edited by Revenge, 25 January 2009 - 05:52 AM. I admire it, altough it's not that great. You still managed to implement love in the game, and that's what makes it special. You must had some hard work on there. First of all, congratulations to all the warning tips about games. I think nobody (may be in error) ever putted some warnings like that, and that's really one of the pros, because they are really important. I had my fun experimenting the characters. The graphics are simple but nice, but the backgrounds kind of ruin it (like the sun in some stage). Yet, I loved all the details, like in the grass moving, etc... Sound fit perfectly. Overall, it's a nice game, you could do a sequel once you get more experience on programming, and, with all the dedication you spent in this one, you could make an even awsome game. Thank you for your input! We're glad you all like it (at least a little). @Zccc: Most of the things you mentioned as cons are being fixed in PB2. Mainly there will be more detail and the backgrounds will be better. About choosing the stage: both players choose a stage and the game chooses randomly between them. And about the simplicity: unless you are referring to the graphics, the simplicity is one of the main points of the game. It's a simple 2-player hotseat platform battle game. However, the graphics are being updated so much more that I can't play PB1 for very long anymore either, simply because the graphics look dull and uninspiring compared to the new graphics. I would play extensively, but I don't have anyone to play with. If you guys need help with platform AI, I could give you some help so people could play single player.